Polycystic ovary syndrome (PCOS) is a condition characterized by the accumulation of numerous cysts (fluid-filled sacs) on the ovaries associated with high male hormone levels, chronic anovulation (absent ovulation), and other metabolic disturbances. Throughout the cycle estrogen levels remain steady, luteinizing hormone (LH) levels are high, and follide stimulating hormone (FSH) and progesterone levels are low. Since eggs are rarely or never released from their follicles, multiple ovarian cysts develop over time. This disease is frequently referred to as "PCOS". Women suffering from this disorder frequently suffer the following symptoms. 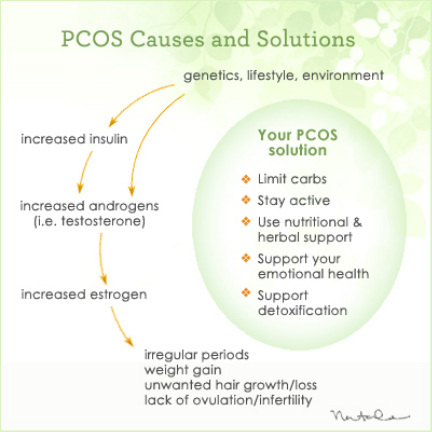 However, all women with PCOS do not necessarily demonstrate all of these symptoms at one particular moment. 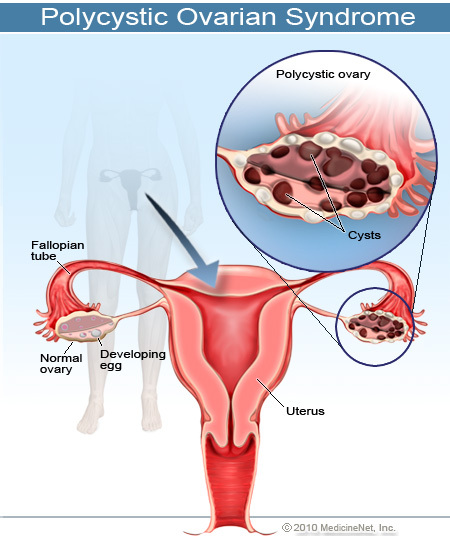 What Is The Cause of Polycystic Ovarian Syndrome? Excess insulin which is when the ability to use insulin effectively is impaired, and your pancreas has to secrete more insulin to make glucose available to cells. The excess insulin might boost androgen production by the ovaries. Low-grade inflammation is when the body's white blood cells produce substances that can lead to insulin resistance and cholesterol accumulation in blood vessels (atherosclerosis). Atherosclerosis causes cardiovascular disease. Research has shown that women with PCOS have low-grade inflammation. Heredity. If your mother or sister has PCOS, you might have a greater chance of having it, too. Researchers also are looking into the possibility that mutated genes are linked to PCOS.. The diagnosis of PCOS is generally made on the basis of clinical signs and symptoms as discussed above. There are several risk-factors associated with this disorder. Diet and exercise have been speculated to have a huge impact of the occurrence of many of these risks developing. Metformin (Glucophage)is a medication used to treat type 2 diabetes. This drug affects the action of insulin and is useful in reducing a number of the symptoms and complications of PCOS. Metformin has been shown to be useful in the management of irregular periods, ovulation induction, weight loss, prevention of type 2 diabetes, and prevention of gestational diabetes mellitus in women with PCOS. The birth control pill, especially those with low androgenic (male hormone-like) side effects can cause regular periods and prevent the risk of uterine cancer. spironolactone (Aldactone) may be prescribed to help reverse acne and excess facial hair growth problems. lomiphene citrate (Clomid, Serophene) is an oral anti-estrogen medication is used to induce ovulation and aid women in the effort to conceive. My name is Erica and I am a 25 year old woman who has been living with Polycystic Ovarian Syndrome since the age of 18. Prior to my first incident with this disorder I had never experienced any symptoms relating to my diagnosis later in my life. Several months after I turned 18, I experienced sudden and severe abdominal pain that was extremely frightening. My husband and mother immediately took me to the hospital where I was told that I had ruptured a cyst on my ovary to which I responded with complete and utter confusion because prior to his I had no idea this was even possible. Four years after my first incident in 2010, I woke up in the middle of the night screaming in agony from pain in my lower abdomen. By this point in time I had already become familiar with the pain and decided to drive myself to the ER. During my visit I had several tests done including an ultrasound and a MRI scan both of which came back inconclusive. After 12 hours of receiving tests and blood work my stomach was showing evidence of distention and I could no longer move my arms because the pain had moved into my chest and shoulders. Later that evening I had a blood pressure of 69/47 and the on call gynecologist was called to my ER room where after some hesitation finally agreed to perform an emergent surgery to find out what was happening in my stomach because I insisted that it was my ovary (contrary to the on call ER doctor diagnosing me with pancreatitis). After I had been anesthetized the doctor immediately found the cause of my pain - a hemorrhagic ovarian cyst that had ruptured into my stomach cavity and over the course of the day emptied two liters of blood into my stomach. I was in surgery for almost five hours for him to recover all the blood in my stomach and transfuse some of my red blood cells they had saved back into my body. I remained in the hospital for four days recovering and was sent on my way home. I spent about 3-4 weeks recovering in bed because I suffered from many incision cuts in my abdomen and I was very anemic and weak. Overall the experience was a rude awakening to the possibility that this genetic disorder could be deadly for someone who is misdiagnosed as I was. Since my first incident almost 7 years ago I have suffered from dozens of ruptured ovarian cysts and have tried multiple treatments that have been mostly fruitless. However, I continue to look for treatment options and remain optimistic that one day a cure will be found for my disorder.